Napoleon Bonaparte celebrated his 46th birthday – August 15, 1815 – as a prisoner on a Royal Navy ship off the northwest coast of Spain. How did he spend the day? After losing the Battle of Waterloo, abdicating from the French throne, and giving himself up to England (see my post about why Napoleon didn’t escape to the United States), Napoleon was taken to Plymouth Sound on the British frigate Bellerophon. 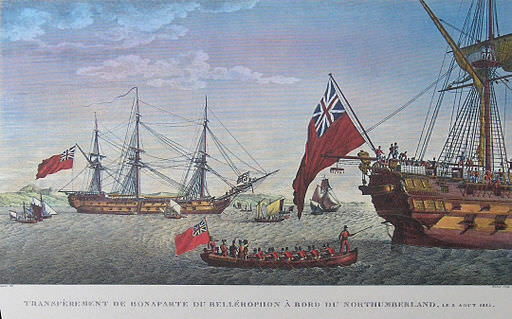 On August 7, 1815 he was transferred to HMS Northumberland, a 74-gun ship of the line, and placed under the supervision of Rear Admiral George Cockburn. The ship set sail for the remote South Atlantic island of St. Helena on August 8. 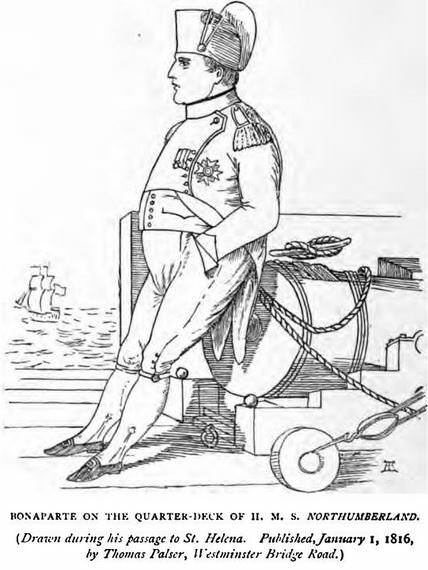 One of Napoleon’s companions, Count de Las Cases, reports on the voyage. [August] 11th-14th – Our course was shaped to cross the Bay of Biscay, and double Cape Finisterre. The wind was fair, though light; and the heat excessive: nothing could be more monotonous than the time we now passed. The Emperor breakfasted in his own cabin at irregular hours; we took our breakfast at ten o’clock, in the French style, while the English continued to breakfast in their own way at eight. The Emperor sent for one of us every morning to know what was going on, the distance run, the state of the wind, and other particulars connected with our progress. He read a great deal, dressed towards four o’clock, and then came into the general cabin; here he played at chess with one of the party: at five o’clock the Admiral, having come out of his cabin a few minutes before, announced that dinner was on the table. [August] 15th – We asked permission to be admitted into the Emperor’s presence this morning, and all entered his cabin at the same time. He was not aware of the cause of this visit: – it was his birthday, which seemed to have altogether escaped his recollection. We had been in the habit of seeing him on that anniversary, on a much larger stage and in the midst of his power, but never were our vows more sincere, or our hearts more full of attachment, than on the present occasion. Napoleon’s valet, Louis-Joseph Marchand, also remarks on Napoleon’s birthday luck. August 15th. We still had light winds and fine weather, with less swell than usual. This may in some measure account for the greater sociability of General Buonaparte. It being his birthday, I made him my compliments upon it, and drank his health, which civility he seemed to appreciate. After dinner I walked with him on deck, and had considerable conversation with him. In the course of it, I asked him whether he really had intended to invade England, when he made the demonstration at Boulogne. 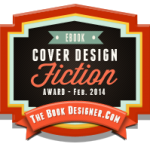 He told me he had most perfectly and decidedly made up his mind to it…. He observed that he had fully believed that his fleet would have deceived ours, by the route and manoeuvres which he directed his officers to make; and that they would have been enabled, by these means, to get off Boulogne, so as to have had a decided superiority in the Channel, long enough to insure him a safe passage. He said that every thing was so arranged, and prepared, that it would only have required twenty-four hours after arriving at the spot fixed upon. He said he had 200,000 men for this service, out of which 6,000 cavalry would have been landed, with horses and every thing else, completely fit for acting the moment they were on shore…. He told me the exact point of debarkation had not been fixed by him, as he considered it not material, and to be determined, therefore, by the winds, and the circumstances of the moment; but that he had intended to have landed as near to Chatham as he conveniently could, in order to have secured our store in that place at once, and then to have pushed on to London by that road…. The General observed, however, that he had relinquished the project, from the moment he found that his fleets had failed him. Having then turned his whole attention to his new enemies on the Continent, his forces collected at Boulogne enabled him to make the sudden movement which proved fatal to General Mack, and gave him all the advantages which followed…. His spirits, throughout this day, have appeared considerably better than for some time past. He won at vingt-et-un, and his good fortune seemed to gratify him the more, as it was his birthday. He did not go to his bedroom this evening until past eleven o’clock. That was Napoleon’s last birthday in the northern hemisphere. He arrived at St. Helena on October 15, 1815 and died there on May 5, 1821. 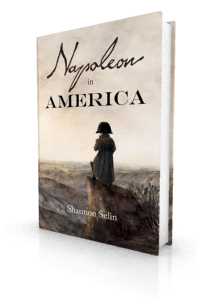 If you’re curious about how Napoleon might have celebrated a birthday if he’d been able to escape from the island, read Napoleon in America. Emmanuel-August-Dieudonné de Las Cases, Mémorial de Sainte Hélène: Journal of the Private Life and Conversations of the Emperor Napoleon at Saint Helena (London, 1823), Vol. I, Part I, pp. 92-93. Louis-Joseph Marchand, In Napoleon’s Shadow (San Francisco, 1998), p. 335. George Cockburn, Buonaparte’s Voyage to St. Helena (Boston, 1833), pp. 34-40. It is perhaps fortunate for Britain that viable steamships were another generation away. It was perhaps fortunate for France’s enemies in Europe that railroads were similarly distant in time. The things the Emperor could have done with either. . .
Staggering to realize the man was only 46 years old in 1815. I don’t understand the comment about steamships. We British always looked to our moat, in Drake’s words, and would without any doubt have kept up with steam technology, and probably have been in the lead with it. Nelson was interested in its potentialities, in fact. When it came, we continued to have the world’s greatest navy. Very interesting about Nap’s birthday. Thank you Shannon. My point was that Napoleon’s invasion plans would have been marginally more workable with steamships rather than less predictable sailing ships (which were more at the mercy of winds and tides). In particular the 1805 invasion plan was the ultimate in Rube Goldberg, because of the inability to unite the Brest, Toulon and Rochefort fleets in any kind of predictable fashion even assuming they could evade the blockade. As it was, the Toulon fleet and the Rochefort squadron got to sea and managed to partially unite and pick up some Spanish ships — this was the fleet destroyed at Trafalgar. But the Brest fleet could never get out. Even so, because of winds (and the possibly more realistic but certainly cautious Admiral Villeneuve, Napoleon could never quite be sure, when, or if, a fleet might wind up in the Channel to make his move. No doubt whatever that the RN (in a counterfactual scenario) would still have the advantage — the British certainly would have kept up with steamship developments. Invasion was always a longshot for Napoleon given his lack of properly trained crews, the conservatism of his insufficiently seasoned officer corps. Still, with steam, his chances for brief mastery of the Channel might have been better, especially if he could get ahead on the adoption curve (Robert Fulton tried to interest him, but the technology was immature). Yes, it’s interesting. Nap could still dream, even in the Bellerophon. And he kept on dreaming, even on St. Helena. On August 15, these gentlemen came individually to wish the Emperor a happy birthday; the Emperor had forgotten about it, and was quite touched by this attention which, without demoralizing him, took him back to happier days.